Pub 2 on my tour de pub Snorbans was the King Harry on an early Tuesday evening. The pub’s situated on King Harry Lane on a busy double roundabout as you enter St Albans from the south side. The junction is a bit of a bottleneck and at one point the council were trying to knock the pub down to improve the junction, a lorry hitting it nearly did the job for them a few months later and the pub was closed for some time. The King Harry was originally on the other side of the road until it moved into the current building, that was two cottages knocked through, opening sometime in the 1800’s. It’s the only pub in the St Stephens district of the City. I used to drink here when I first moved to St Albans, as very good friends lived on the estate adjacent. They were married in St Stephens opposite the pub, the occasion of which the bastards had asked me to do their wedding camcordering. There was so much light flooding into the church I couldn’t tell whether the damn thing was on or off and therefore had to nip into the King Harry to calm my nerves, worried that I had missed the vital shots. At that time the pub had a large Benskins sign on it, a pool table in the back bar and didn’t have half the choice of beers it has on today. The only Cask beer on was Doombar which seemed to be very popular in the pub. I have decided to ask people I meet two questions; what do you like in a pub? and what do you like about this pub? So I ordered a lovely milk stout on keg from Thornbridge called Ena and wandered over to talk to a bloke called Paul who looked like he could be a local. Now I love beer, and I will do anything for love, but like Meatloaf I won’t do Doombar (we all know that’s what the big guy meant!) Paul was a local who told me he comes into the pub most days, he used to drink in The Duke Of Marlborough down the hill but that closed a couple of years ago to make much needed funds for property developers. The Duke was an after work pub for me briefly, and once I recall being so desperate for a pint I stopped my car outside, opened the car door and a lorry promptly took it off. I blamed the lorry driver who didn’t stop and the fact I had named the car Lucifer after the letters in its number plate. Lucifer was not happy as I had agreed to sell him three days before. It was an expensive pint! of a “I Love you will U Marry Me”, a hoppy slightly sweet strawberry beer which was OK but not really for me. The Camden “Other Pils ” was much more to my tastes although tasted more like a hoppy pale ale to me. Thornbridge have had a tap take over at the King Harry and it has been so successful that going forward the pub is going to have one permanent Thornbridge line on. The 8 week takeover,which is happening in over 100 M&B Castle pubs ends on the 17th March. The picture below shows Lulu looking for a new Pink Brewdog Punk bottle as she feels by drinking that it will empower her and lead to the end of pay inequality, but then again she has a brain the size of a walnut like some of the dudes in Aberdeen. I then spoke to Joanna and Kaylee. They like the King Harry as it’s local to them and they can sit in the small bar looking out the window at the traffic. Joanna likes the ambience in a good pub and particularly likes the Peahen in the centre of town whilst Kaylee likes a pub that does a good Sunday Roast! The King Harry has one very small room with a small bar but no pumps on it, the main area which includes a small eating area, and a large snug at the back of the pub. Now Paul was correct about the staff here, the assistant manager John is a lively fellow from Wexford and his very knowledgeable barman Jamie is great lad to chat to also. I can see from them why the locals feel at home here. Jamie was teaching me about the importance of Patagonian yeast in Lager and how to use my camera correctly. With the warm welcome received I will try to visit again soon, I will go later in the week when they are more likely to have more than one cask on, but I’d always rather they have just one cask on than a few past their best like some pub serve on a Tuesday. I ‘ll strive to make that visit whilst the pub is still named after Henry V and not as is a possibility in the future The King Harry Markle-Windsor! Ps Elvis and Lulu didn’t fancy the walk home on the dark Alban way, so my wife picked me up and found this is the third pub in a row we have been to that doesn’t sell her favourite tipple – sherry! I have decided to do a temporary blog as I visit every pub again in St. Albans, inspired by beer writers Peter McKerry (http://www.brewgeekery.com/) and Matthew Curtis ( UK Beer Editor of http://www.goodbeerhunting.com/) who will be visiting all the pubs in N8 where they live. Alec Latham ( http://www.mostlyaboutbeer.co.uk/) a local beer writer had also encouraged me to revisit the Farriers Arms, a pub for years I have avoided and which many had nicknamed “The Slaughtered Lamb” because of previous welcomes. It was great and I shall be back again for a lovely pint of Betty Stogs and a good welcome soon. The other reason is that there are obviously not enough bloggers in England, the current England blog manager bemoaning only recently that she only had 3 million to choose from for her six person team. I moved to St. Albans in 1995 after living for a few years in Droylsden, Manchester and like most sensible people decided to visit every pub as soon as possible. Three months later I had visited them all, over 70 pubs back then. I cannot remember that much other than being served by Melvin Hayes in the White Hart Tap, being offered a car stereo within 5 minutes of entering the King Offa (now closed ) and there being lots of no longer seen Benskins signage about. To help with conversation I will in most cases be taking our small dog Lulu with me and Elvis. I decided to start with a pub I know fairly well as it has become the after work Friday pub of choice for a group of us. This group probably says a lot about the current population of St Albans – they mainly commute into London for work and none are originally from St. Albans. They are from Belfast, Edinburgh, Sutton Coldfield, Bolton , Whitley Bay and myself the only one from Hertfordshire. You do not meet many people actually from St. Albans – rising house prices have moved locals north to places like Hitchin, where I am from, and people in Hitchin, for the same reasons, have moved to Biggleswade and so it carries on until you reach the North Sea. Lots of couples move to St. Albans from London with pre-school children or arrive to breed. They find they can afford a house rather than a flat for similar money along with better local schools and a commute of under half an hour into the City of London – it is seen as a no brainer. I’ve pictured an education shop which has recently opened that maybe shows the changing types moving into the area in recent years since house prices went chicken oriental , remember in certain areas not all piglets are equal! 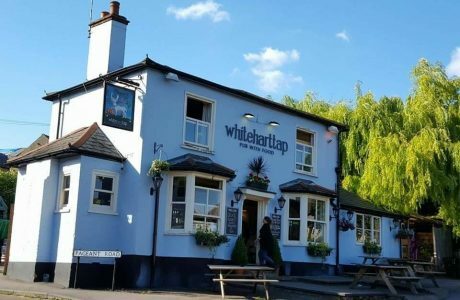 These families do not tend to be regular pub goers so the increase in population has not helped with pub closures, but has prompted an increase in upmarket shops and restaurants in St Albans and a few Gastrofied pubs. The Robin Hood opened in the late 1860’s as a new build pub in what was then Sweet Briar Lane, with the whole length of the road not becoming Victoria Street until 1897. The mock Tudor building is the second nearest pub to St Albans station and probably opened it the first place partly due to the newly opened Railway Station in 1868. The building is attached to a much higher very ugly Iceland Store circa 1980’s. How planning justified that when they won’t let me have a dormer because ‘ it’s not in keeping ‘ who knows! 3 cask ales on, the one permanent beer being the wonderful Harvey’s Sussex Best Bitter from Lewes. The Robin Hood is included as one of the St Albans pubs in the CAMRA Good Beer Guide. I would guess the clientele is from the 35 plus range who enjoy a chat below the low level music played from the old style jukebox. The preferred sport of the pub is Rugby Union with a few Sarries fans amongst others attending on a regular basis. The bar manager Roy is about as nice a bloke as you could hope to meet behind a bar and takes a lovely photo with Elvis. Elvis got me talking to a local called Darren who told me he was a Teddy Boy in the 1970’s and was pleased to see that Elvis had finally made it down from Prestwick Airport. It is important for me that a pub has clean toilets first, well served beer and pleasant staff, this pub ticks all those boxes and although Elvis would prefer a little less conversation this is the type of place where you can easily get into a chat about bugger all as most of us do in pubs. I will be picking the pubs randomly to visit in St. Albans, but if anyone wants to make suggestions I will happily drag Elvis and Lulu over to wherever you suggest first.